As I continued my journey into the strange and unsettling, I turned my gaze to the simian subject. Not until I rewatched both Rise of the Planet of the Apes and Dawn of the Planet of the Apes did I come to realize that I am fascinated by apes. The fact that they look so much like humans yet so different in weird ways fills me with a strange mix of curiosity and terror, and that’s why I immensely enjoy anything that has a chimpanzee or a gorilla in it. Case in point: I am looking forward to watching Kong: Skull Island this weekend and I’m just so excited to see War of the Planet of the Apes coming soon this year. 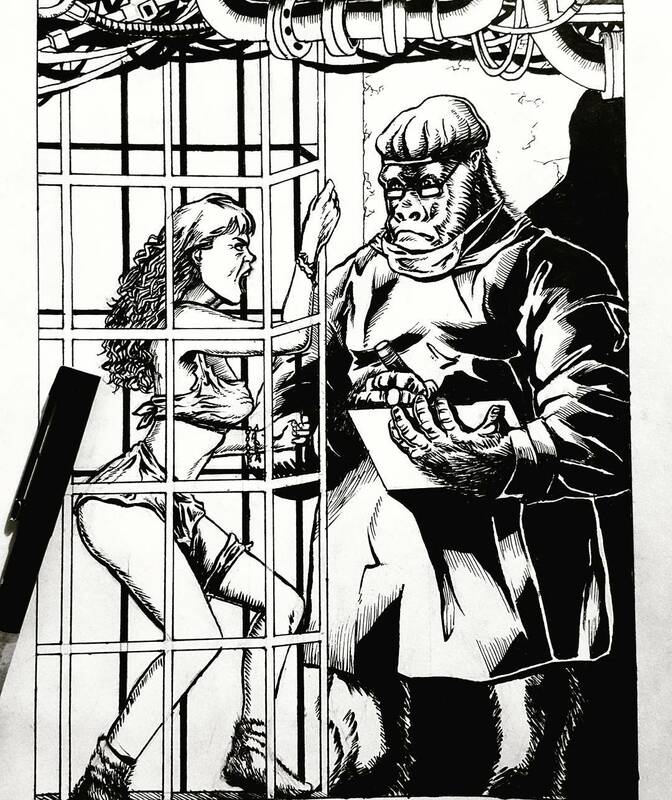 Anyway, I wanted to draw a gorilla in a human outfit, so I picked this scene in my head that I guess could happen in the Planet of the Apes universe (I’ve seen the original classic film, by the way, a long time ago and thought it was marvelous). I also wanted to draw a scantily clad woman, as seems to be always the case, so the result was the illustration above. While the final drawing is interesting, I admit that this piece was actually the most frustrating thing I’ve done in a while. I knew when I was penciling it that it would be difficult, but inking it was even more excruciating. My paintbrushes gave very early into the inking process and not 10 minutes had gone by and I was already basically playing with ink blots. The strands wouldn’t come to a point and they were absorbing ink by the gallon, which dried up fast. I’m using synthetic brushes, so this experience finally made me decide to get pricier natural hair ones for my next illustration. In fact, this experience taught me more than that; It taught me that I needed to work on my perspective, patience, shadows, feathering, folds, etc. 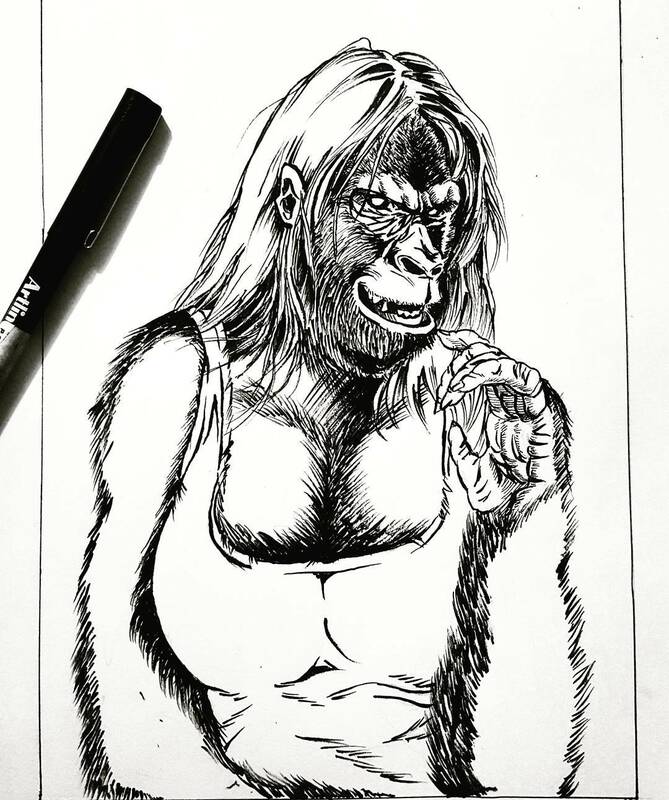 Not fully satisfied with what I ended up with, I took another stab at a strange gorilla drawing. By this time, my hand was already aching but I was just so unsatisfied with my initial output that I had to do it. This one I thought came out better because it was a large, simple portrait. There was just more room for my ruined paintbrush to move, so the image breathed out more. Still, I feel like there are too many lines here precisely because my no-good brush didn’t want none of my bidding anymore. This obsession with apes isn’t over. Stay tuned for more. Both came out fabulous, Frustrashow! I especially like your inking of the damsel in distress. I can see it, say, in a comic book. The massive gorilla observing her came out nice too. 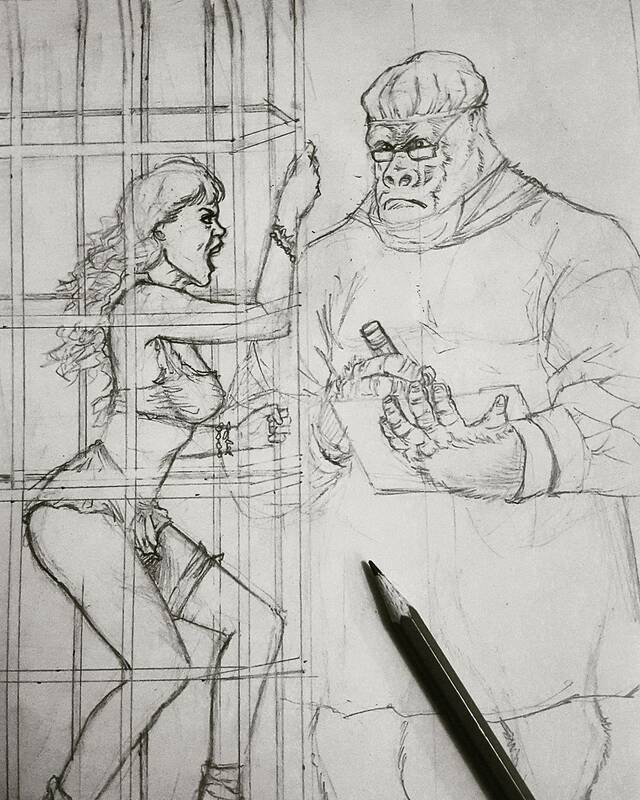 Let me know what you think of Kong. I will go to see soon too. Ha. Thanks, blogturtle! I was specifically aiming for the comicbook look, so I’m glad to know it has that effect on you. Kong was AWESOME! In my opinion, it was much better than the last one directed by Peter Jackson which was boring in some parts. This latest one doesn’t try too hard to be emotional; it just delivers great action and visuals, which after all are what people really look for in a King Kong movie. I highly recommend you watch it!